Unless you're one of the lucky 7%, then you probably are. 7 will sell without a price reduction and reach completion. 23 will sell after one or more price reductions and reach completion. 20 will sell, but will not progress to completion. 30 will not sell, and end up being passed from agent to agent. 20 will not sell, and will not come back onto the market. 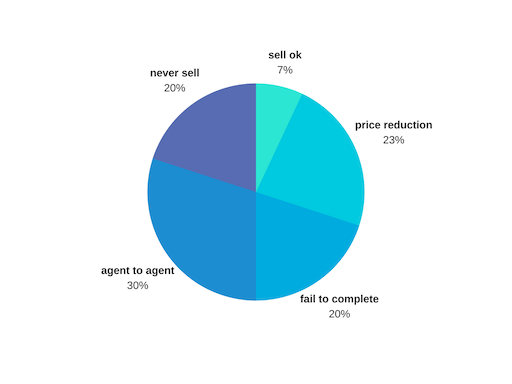 Around 50% of properties do not sell with the first agent! Eventually after successive attempts, about 50% will sell and 50% will give up! But if you're trying to sell for the first time, then things are even worse – you're likely to experience a 70% failure rate on your first attempt. This means a person has a greater chance (46%) of surviving an "average" cancer than completing (30%) the sale of their house the first time around. Is it any wonder that 75% of people don't trust estate agents? On average, 1 in 3 houses will get reduced in price. In the Colchester area, 25-40% get reduced in price. Homes with a 5% price reduction take 2 months longer to sell. The average UK house sells for only 90.4% of its original market price. According to ‘Which?’ vendors lose £4,300,000,000 a year to overvaluing. Are you feeling disillusioned because your current estate agent has failed to sell your property? But you can join the "lucky" ones. On average, our vendors achieve over 102% of the original asking price and accept such an offer in 55 days. In reality, our new listings achieve over 103% of asking price in under 21 days. First, you should know that success does not rely on "luck" but the right preparation. How about I give you a call and see how I can help you? We've studied the Colchester area and seen some abnormally long delays in selling lovely properties that should have sold in weeks, let alone months or even years in some extreme cases. Right now, the area is booming. It’s attracting a huge influx of new people. New properties are spreading like wildfire and selling like hotcakes. The demand is definitely there, so why are you struggling to sell? We've studied every single Colchester postcode and analysed the correlation between price and days to market. In the more affluent Colchester postcodes, it's taking 169 days to find a buyer for properties around £600k, over 200 days for an average price of £800k, and nearly 250 days for homes over the million pound mark. Our in-depth research also discovered that most marketing strategies were flawed from the start. Online campaigns were rushed and of subpar quality, which meant the houses were not shown to their full potential. This was not the fault of the vendor - these properties should have been selling. Your house is most likely your greatest asset. You wouldn't try to sell a Ferrari through a scrap yard. So why would you sell your high-value house through an estate agent that deals in more affordable markets and lettings? Has your house received the best marketing strategy money can buy? If you're struggling to sell your home, we don’t believe it has. • Have the presentation and pictures been rushed? • How happy are you with the multimedia content published by your agent? • Who presented the viewings? • How would you rate your Estate Agent? • Was it the right time of the year to sell? • Have you been trying to sell for too long now that it's affecting the saleability? We strongly believe that the presentation, the home staging, the photography, and the brochures should be of the highest quality to sell your property faster at the highest price. Learn more about our successful bespoke marketing approach. Do you need to drop the price and by how much?